BEIRUT: An explosion targeting a US Embassy vehicle ripped through the Karantina industrial zone near Beirut on Tuesday, leaving three people dead and at least 21 wounded. Two embassy security employees, both Lebanese citizens, were in the vehicle at the time of the attack, according to an embassy statement. One suffered minor wounds, while the other emerged unscathed. Two people in a Fiat were killed when their car, traveling just meters behind the embassy vehicle, bore the brunt of the explosion. The vehicles were traveling along the sea route, a road parallel to the main Dora/Karantina highway, which experienced heavy congestion in the hours following the blast. The Fiat was registered to one Joseph Khalil Khoury, a Sin al-Fil resident, according to a security source. The identities of the two victims inside the car could not be readily established as they were badly burned. A third man killed in the blast was identified as Ghassan Ali al-Hussein, a Syrian national who was riding a motorcycle. The US State Department said Tuesday one "private US citizen" was also slightly wounded. The man was identified as a bystander who happened to be in the area at the time and was not affiliated with the US government or the embassy vehicle, said State Department spokesperson Sean MacCormak. The armored embassy vehicle bore no diplomatic plates, only one set of Lebanese license plates in the back. The vehicle was returning from Beirut's Rafik Hariri International Airport after dropping off an embassy staffer, according to media reports. The embassy vehicle was damaged on its right side and pushed off the road by the power of the blast. A senior security source told The Daily Star that the US Embassy vehicle was in the area on a scouting mission to ensure the road was safe. "The road was under surveillance all day. It was to be used by US Ambassador Jeffery Feltman, who was planning to attend a farewell party at the Phoenicia InterContinental Hotel held in his honor Friday evening," the source said. The party was cancelled as a result. Many of the wounded were working in nearby buildings and factories at the time of the blast. They were taken to both Mar Youssef Hospital in Karantina and Jeittawy Hospital in Achrafieh. Army forces imposed a security cordon around the area and blocked access to the blast site, causing heavy traffic. Heavily armed US Embassy security staff were als on hand. The security source said the bomb had been placed behind two metal dumpsters, attached to the wall of a two-story building on the side of the road and to the left of the embassy vehicle as it passed. The device went off after the embassy car had passed the dumpsters, thus the vehicle immediately behind the embassy car sustained the full blast. State Prosecutor Saeed Mirza, who visited the blast site, took personal charge of the investigation since the bombing targets a diplomatic mission in the country. Also visiting the blast site Tuesday were the government commissioner at the Military Tribunal, Judge Jean Fahd, and Military Investigatiing Magistrate Rasheed Mezher. Two men were taken into custody by Lebanese Army soldiers at the blast site. It was not immediately clear if the two were suspects in the case or just being taken for questioning. BEIRUT: The Lebanese government strongly condemned the bombing that targeted a US Embassy vehicle on Tuesday, one day before Arab League Secretary General Amr Moussa's expected return to Lebanon to continue his mediation in the country's domestic political crisis Information Minister Ghazi Aridi, addressing reporters following a scheduled ministerial meeting Tuesday evening, said all indications were that Moussa's visit Wednesday was still on. Aridi offered the government's deepest condolences to the families of the victims of the attack, wished the wounded a swift recovery and expressed commitment to protect all diplomatic missions in the country. The ministerial meeting, chaired by Prime Minister Fouad Siniora, was held to discuss the Arab initiative and Moussa's return to Beirut. "This bombing targets Lebanon at a politically critical and delicate juncture," Aridi said, adding that the government embraced the Arab initiative to fill the vacancy in the presidency and end the series of bombings that have plagued the country since 2005. "The attack, whether it targeted the US Embassy or any other, was on Lebanese soil and as a result it targets the security of the Lebanese," he said. "Innocent martyrs fell today who have nothing to do with all that is happening politically. They were not embassy staff, whose vehicle was targeted. Therefore these attacks target the security and stability of Lebanon." Hizbullah leader Sayyed Hassan Nasrallah, whose group is labeled a "terrorist" organization by the US, also spoke out against the blast. "We condemn and denounce any explosion that takes place on Lebanese territory," he said, "regardless of who is targeted, and especially if innocent people are killed." Parliamentary majority leader MP Saad Hariri said the bomb targeted stability in Lebanon. He said the perpetrators do not wish to see the country return to normality. 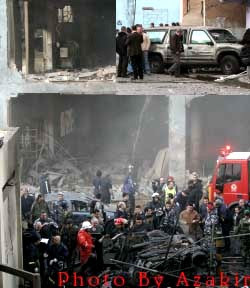 Hariri said he regretted that innocent Lebanese had paid a heavy price for continuous attacks targeting their country. He said he had called US Ambassador Jeffrey Feltman to confirm that he was unharmed and expressed regret on the injury of two embassy staffers.